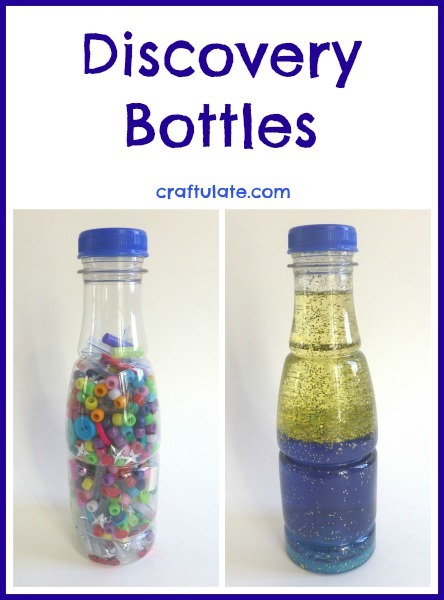 Here are two discovery bottles that my son loves: a shaky bottle and a glittery bottle! Both discovery bottles were made using empty Fuze bottles – they are a great size and shape, but pretty much any bottle can be used. 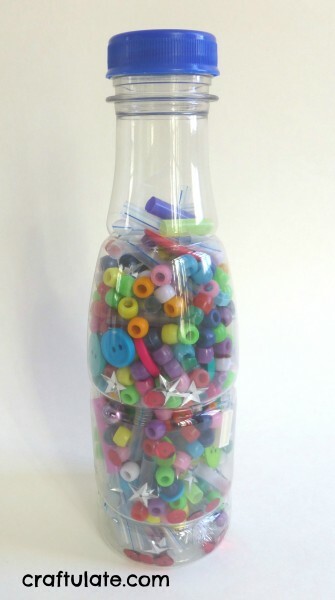 For the first bottle I collected all kinds of items that would rattle, including beads, small pompoms, buttons, straws and sequins. Dollar stores are great for picking up cheap filler items! F spent a long time investigating all the items he could see in the bottle, and then had lots of fun shaking it too! For the second bottle I used a mixture of baby oil and water. I added the water first, with some blue food dye, shaking it gently to mix. Then I topped it up with the oil and sprinkled in some loose gold glitter. The blue mixes in with the water, and the glitter suspends in the oil. If you shake the bottle it all mixes together and then slowly separates. It is fascinating to watch but it also works well as a calm-down tool. Note: I sealed both of the discovery bottles with a hot glue gun. F can’t quite unscrew things yet but he’s not far off – and obviously he should not ingest any of the contents. These bottles should always have adult supervision. I love this variation of the oil and water bottle! Here are a few more to try! Sensory bottles are my FAVE!!! PS- Thank you for being one of the few bloggers out there that actually includes safety notes for you readers!